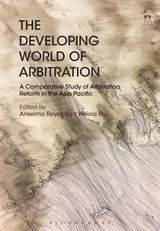 "China's Arbitration Modernisation Under Judicial Efforts and Marketisation Waves"
in Anselmo Reyes and Weixia Gu (eds), The Developing World of Arbitration - A Comparative Study of Arbitration Reform in the Asia Pacific (Hart Publishing, January 2018), pp. 17-38. Introduction: Since 1978, China's drive towards economic modernisation and marketisation in its policy of 'reform and opening up' has led to increased foreign trade, investment, and as a natural corollary, commercial disputes. Arbitration, the preferred means of settling business disputes in China, plays a significant role in providing foreign cooperative partners with the confidence and reassurance that are necessary to encourage trade and investment.